As we enter mid-October, the identity of each NFL team’s offense has begun to emerge. Some teams, like the San Francisco 49ers, want to run the ball no matter the situation. 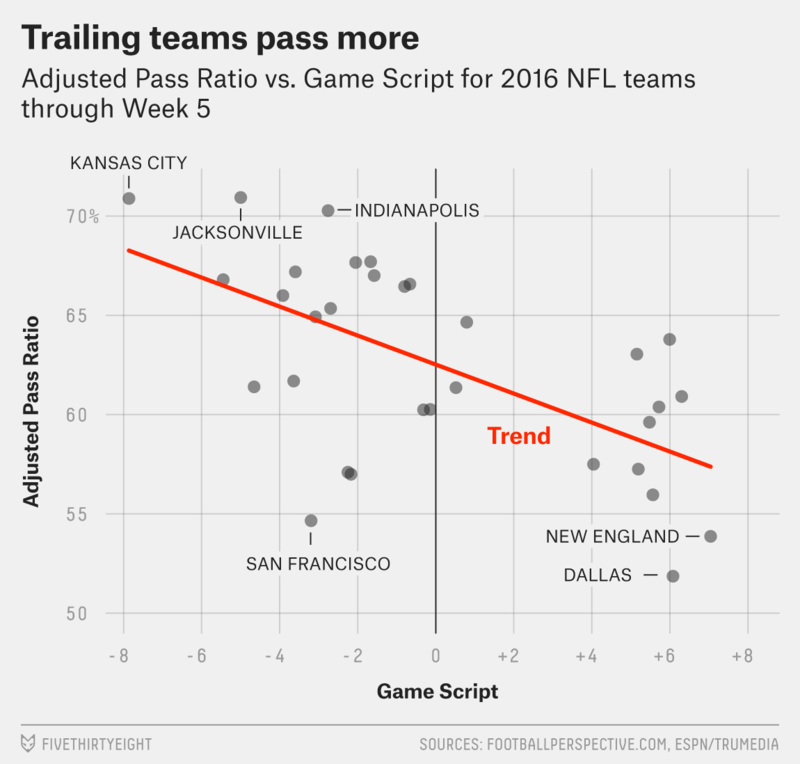 Others, like the Indianapolis Colts, are pass-happy even when most other teams wouldn’t be. How do we know what teams’ preferred style is? It’s not as easy as looking at their basic stats: Those are shaped by factors outside of their control, like being forced to pass more when trailing. So I’ve created a way to adjust for external forces and classify teams based on how they choose to play offense regardless of the numbers on the scoreboard. Counting scrambles (but not designed QB runs) as pass plays rather than runs. This is an improvement, because although a scramble is counted on the stat sheet as a run by the quarterback, the play actually signals that the team’s intention was to pass. Eliminating kneel-downs. While these are recorded as runs in the box score, they are best simply ignored because the offense did not intend to advance the ball. Eliminating spikes for a similar reason; these are recorded as passes in the box score but should be excluded for purposes of quantifying an offense’s identity. The Jacksonville Jaguars (Adjusted Pass Ratio of 70.9 percent), Kansas City Chiefs (70.9 percent) and Indianapolis Colts (70.3 percent) rank as the most pass-happy teams in the NFL by this metric. But those three teams have trailed, often significantly, for large stretches of their games.1 And, of course, trailing teams tend to throw more, while leading teams rely on the ground game to run out the clock. That’s why it’s crucial to adjust for pass ratio by something I call Game Script. A team’s Game Script, a statistic I derived in 2012, is simply its average point margin over the course of a game or season, with each second of the game given equal weight. This metric isn’t designed to tell you something you don’t already know from watching the games; on the contrary, it is designed to quantify exactly how the game played out. This season, the New England Patriots — even without Tom Brady for four of five games — have the best average Game Script, at +7.0, meaning that the team has led by 7 points on average over the course of every minute of play this season. That’s because New England tends to get off to a hot start: The Patriots have led by 7.2 points after the first quarter of games this year, the best rate in the league. The table below presents the same information, along with a differential2 between our Adjusted Pass Ratio and the Adjusted Pass Ratio we’d expect a typical team to have based on its Game Script (i.e., its Expected Adjusted Pass Ratio).3 Here, a positive number means a team is more run-heavy, while a negative number means a team is more pass-happy. The 49ers stand out as the most run-heavy team in the NFL. A lack of faith in the passing game is likely the biggest reason that Chip Kelly just benched Blaine Gabbert for Colin Kaepernick. The 49ers are a bad team, which would typically yield pass-heavy statistics; instead, San Francisco has the third-lowest Adjusted Pass Ratio this season before we adjust for Game Script. Note that traditional metrics (which would count a scramble as a run, not a pass) make the 49ers look even more run-heavy: The 49ers lead the league with 16 scrambles. The Tennessee Titans also come across as very run-heavy, which isn’t surprising to fans who were expecting to watch “exotic smashmouth” football. Tennessee has become more run-heavy as the season has progressed and now looks like one of the top running teams behind running backs DeMarco Murray (92.2 rushing yards per game, 5.0 yards per carry) and Derrick Henry (a first down on 29.4 percent of his carries, second-best rate among running backs). Given that the Titans’ top two receivers were fifth– and seventh-round draft picks, a run-heavy game plan makes sense. And like San Francisco, the Titans look even more run-heavy if you treat Marcus Mariota’s nine scrambles for 87 yards as runs. The Dallas Cowboys and Los Angeles Rams, behind superstar running backs Ezekiel Elliott and Todd Gurley, also come off as run-heavy. Dallas has the lowest Adjusted Pass Ratio in the NFL through five weeks; despite the team’s strong Game Script (+6.1), the Cowboys still clearly identify as a run-heavy team. Los Angeles, meanwhile, is blessed with Gurley but saddled with Case Keenum, owner of the lowest Total Quarterback Rating (QBR) in the NFL. At the bottom of the list, star quarterbacks tilt the scales. Having Ben Roethlisberger, Andrew Luck, Drew Brees or Aaron Rodgers will cause a team to shift its ratio to the passing attack regardless of the score. But the presence of Chicago and Baltimore may surprise some folks. Brian Hoyer leads the NFL in completion percentage, at 71.4 percent; he’s playing the best football of his career, which helps explain why the Bears are passing so much with their starting quarterback out. And until turning to Jordan Howard as the starter the past two weeks, Chicago had been one of the worst running teams in the NFL. Monitoring how the offense’s pass identity changes as we see more from both Hoyer and Howard will be one of the more interesting subplots of the Bears’ season. And then there are the Ravens, who just fired offensive coordinator Marc Trestman. Some of the numbers here can help explain why. Over the past four weeks, quarterback Joe Flacco has thrown at least 40 passes in each game, despite having the worst yards per attempt average over that period of any passer. Worth monitoring this weekend against the New York Giants: whether new Ravens offensive coordinator Marty Mornhinweg switches to a more run-heavy approach. These metrics helped identify which teams have been more likely to pass or run the ball, given the context of the score of the game. A team’s identity as a pass-happy or run-happy team can change, so we’ll revisit this idea in a few weeks to monitor those developments. But for now, this is a simple way to identify those teams that philosophically appear skewed toward the run or the pass. Kansas City has trailed by an average of 10.8 points at halftime in games this year, the worst margin in the league. The Colts (-5.2) and Jaguars (-5.0) have also been bad in the first half of games: They have the third- and fourth-worst average halftime margin, with the Dolphins and Chiefs rounding out the bottom four. Based on a best-fit linear model using average Game Script as the input and average Adjusted Pass Ratio as the output. Note that the only adjustment involved here is for Game Script. While other external factors may influence a team’s Adjusted Pass Ratio, the focus here is on Game Script because of how significantly the score affects a team’s decision to run or pass.